When you do zazen, find a quiet place where you can sit without disturbances. It should be neither too dark nor too bright, warm in the winter and cool in the summer. The sitting place should be neat and clean. If possible, a statue of Manjushri Bodhisattva should be enshrined in the room. If there is none available, any statue or painting of a Buddha or a Bodhisattva is fine. Also, when possible, place an offering of flowers on the altar and burn incense. Avoid sitting when you haven't had sufficient sleep or when you are physically exhausted. Before sitting, eat moderately and avoid alcohol. Wash your face and feet so that you feel refreshed. Avoid wearing soiled clothing or garments which are luxurious or expensive. It is also advisable to avoid heavy garments. Wear your clothing loosely but neatly. In Japanese Zen monasteries, socks are not worn in the zendo. Place a thick square mat (zabuton) in front of the wall and put a zafu on it. Sit down, placing the base of your spine at the center of the zafu so that half of the zafu is behind you. After crossing your legs, rest your knees firmly on the zabuton. Place your right foot on your left thigh, and then your left foot on your right thigh. Cross your legs so that the tips of your toes and the outer edge of your thighs form a single line. Simply place your left foot on your right thigh. When you cross your legs, your knees and the base of your spine should form an equilateral triangle. These three points support the weight of your body. In full-lotus position (kekkahuza), the order of crossing the legs may be reversed, and in half-lotus position (hankahuza), raising the opposite leg is acceptable. Rest both knees firmly on the zabuton, straighten the lower part of your back, push your buttocks outward and hips forward, and straighten your spine. Pull in your chin and extend your neck as though reaching toward the ceiling. Your ears should be in a line parallel to your shoulders, and your nose should be in line with your navel. After straightening your back, relax your shoulders, back, and abdomen without changing your posture. Sit upright, leaning neither to the left nor right, neither forward nor backward. Place your right hand, palm-up, on your left foot, and your left hand palm-up on your right palm.The tips of your thumbs should be lightly touching each other. This is called Cosmic Mudra (hokkai-join). Place the tips of your thumbs in front of your navel, and your arms slightly apart from your body. Keep your mouth closed, placing your tongue against the roof of your mouth just behind your teeth. Keep your eyes slightly open. Cast them downward at about a 45-degree angle. Without focusing on any particular thing, let everything have its place in your field of vision. If your eyes are closed, you will easily drift into drowsiness or daydreaming. Quietly make a deep exhalation and inhalation. Slightly open your mouth and exhale smoothly and slowly. In order to expel all the air from your lungs, exhale from the abdomen. Then close your mouth and continue to breathe through your nose naturally. This is called kanki-issoku. Place your hands palms-up on your knees and sway the upper half of your body from left to right a few times. Without moving your hips, move the trunk as if it were a pole leaning to one side then the other, so that the waist and hip muscles are stretched. You may also sway forward and backward. At first this movement should be large, gradually becoming smaller and smaller, and ceasing with your body centered in an upright position. Once again forming the hokkai-join with your hands, assume an unmoving upright posture. During zazen, breathe quietly through your nose. Do not try to control your breathing. Let it come and go so naturally that you forget you are breathing. Let long breaths be long, and short breaths be short. Do not make noise by breathing heavily. Do not concentrate on any particular object or control your thought. When you maintain a proper posture and your breathing settles down, your mind will naturally become tranquil. When various thoughts arise in your mind, do not become caught up by them or struggle with them; neither pursue nor try to escape from them. Just leave thoughts alone, allowing them to come up and go away freely. The essential thing in doing zazen is to awaken (kakusoku) from distraction and dullness, and return to the right posture moment by moment. When you finish zazen, bow in gassho, place your hands palms-up on your thighs, sway your body a few times, first a little, and then more extensively. Take a deep breath. Unfold your legs. Move slowly, especially when your legs are asleep. Do not stand up abruptly. 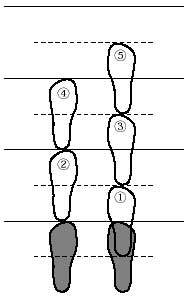 When doing kinhin, walk clockwise around the room, holding your hand in shashu position. From the waist up, your posture should be the same as that in zazen. Take the first step with your right foot. Advance by taking only half step for each full breath (one exhalation and inhalation). Walk slowly and smoothly as if you were standing in one place. Do not drag your feet or make noise. Walk straight ahead, and when turning, always turn to right. The	word kinhin means to go straight. When you finish kinhin, stop and bow. Then walk at a normal pace around the room until you return to your seat. Sit upright in a chair as you would on a zafu. Do not lean backwards. Use a square support cushion on the seat and/or under your feet as needed to find a comfortable upright posture. Hold your hands in your lap in the Cosmic Mudra (hokkai-join). This is a variation on the traditional Asian way of sitting. It allows you to form a seated triangle with knees and the base of your spine, but the center of gravity is a bit higher than sitting in full or half-lotus. Sit on a seiza bench, a low platform, with your legs folded under the bench, knees firmly on the zabuton. You can also support yourself by sitting on a firm zafu instead of a bench. The Burmese position for sitting crosslegged provides good stability for zazen if you are not able to sit in full or half-lotus. In this posture, seat yourself on a zafu in the usual way. Cross your legs with the left leg and foot on the floor, tucked against your right inner thigh. The left leg is then folded outside the right, also supported by the floor.The order of crossing the legs may be reversed. About breathing during zazen, Dogen Zenji said in The collection of Dogen Zenji's formal speeches and poems (Eihei-koroku), vol. 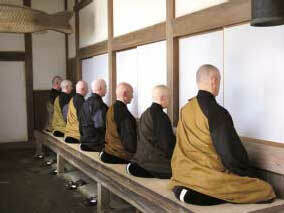 5: In our zazen, it is of primary importance to sit in the correct posture. Then, regulate the breathing and calm down. In Hinayana, there are two elementary ways (of beginner's practice): one is to count the breaths, and the other is to contemplate the impurity (of the body). In other words, a practitioner of Hinayana regulates his breathing by counting the breaths. The practice of the Buddha-ancestors, however, is completely different from the way of Hinayana. An ancestral teacher has said, “It is better to have the mind of a wily fox than to follow the way of Hinayana self-control.” Two of the Hinayana schools (studied) in Japan today are the precept school (Shibunritsu) and the school based on Abhidharma-kosa (Kusha). There is also the Mahayana way of regulating breathing. That is, knowing that a long breath is long and that a short one is short. The breath reaches the tanden and leaves from there. Although the exhalation and inhalation are different, they both pass through the tanden. When you breathe abdominally, it is easy to become aware of the transciency (of life), and to harmonize the mind. My late teacher Tendo said, “The inhaled breath reaches the tanden; however, it is not that this breath comes from somewhere. For that reason, it is neither short nor long. The exhaled breath leaves from the tanden; however, it is not possible to say where this breath goes. For that reason, it is neither long nor short”. My teacher explained it in that way, and if someone were to ask me how to harmonize one's breathing, I would reply in this way: although it is not Mahayana, it is different from Hinayana; though it is not Hinayana, it is different from Mahayana. And if questioned further regarding what it is ultimately, I would respond that inhaling or exhaling are neither long nor short.